Members of the Mizuno Impulse '06 team at the 2018 World Series with Paige Parker, the Oklahoma pitching standout. 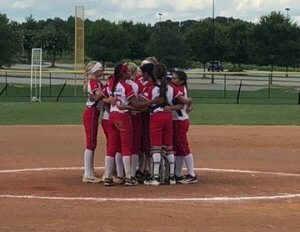 At Extra Inning Softball, we cover everything for youth and club up to international and professional fastpitch softball and are always on the lookout for fun, talented and colorful teams and players. Today we found a second-year 12U team that hits all three! “Driving endless stretches of blacktop to another softball tournament we found ourselves in the eye of yet another dust storm. The team is split with 2006’s and 2007’s with some not graduating until 2026, and frequently plays up in age divisions, but not in major tournaments. 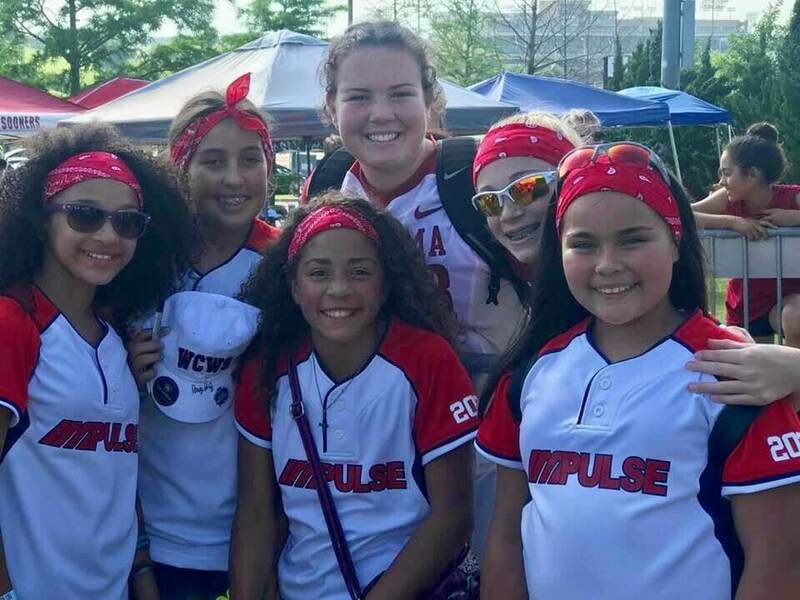 The Impulse squad plays on traveling to the Colorado Sparkler in 2019 and will try to make it to PGF Nationals as well. Mizuno Impulse '06 team photo... where softball dirt travels from! This, however, isn’t about future stars, championships and college recruiting--although the team was selected by one peer-reviewed website as being in the Top 10 of its age division. Some say West Texas doesn’t offer much but our roots travel much deeper than any amusement can offer. We are surrounded by a sea of mesquite and spindly ocotillo which only some can appreciate, our cuisine is as authentic as the menudo and blue-corn tortillas, and at night you can easily enjoy looking up at the clear view sky to see every star. For girls, volleyball is the game of choice and basketball or football can easily take the cake as a first love. Softball is low on the totem pole. Who Are The Mizuno Impulse ’06 Players? Amongst all the vast, wide open spaces, there is a small group of girls that love, live, and breathe the sport of softball. Softball in West Texas is anything but vast, but we think that is what makes what they do even more special! A comment was made about how we should travel outside of West Texas to play ball, but that isn’t always possible. Our team does not recruit girls from all over the United States and we cannot pull girls from a large metro-plex. Our team is made up of all local girls (within a two-hour radius). Our coach can see potential and grow with them and not just pick up the best nine. He is a coach, not a recruiter and that, in and of itself, is something special in the travel ball world. 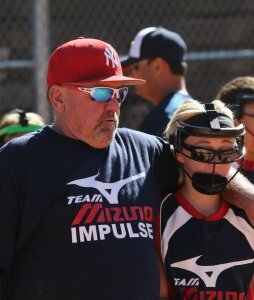 Terry Clemmer has been the Team Mizuno Impulse ’06 head coach for more than six years, although the team has had different names in the past but the majority of the same girls. 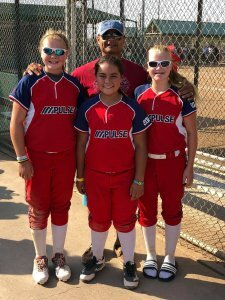 Mizuno Impulse '06 Head Coach Terry Clemmer with Hannah Wells, Mia Clemmer & Emma Davis. This group of girls has what it takes, just not always the resources, to get there. Coach Clemmer has quite a resume under his belt and has been sharing his knowledge and love for the game ever since he started his coaching career. In his high school days, he was named District Player of the Year, Big Country Player of the Year, All State as well as a four-year 1st Team All Districts selection. His college playing days were nothing short of amazing either. Clemmer attended New Mexico Junior College and finished his playing time at Texas State University. While at these schools he was a two year All-Conference 1st Team honoree, a Texas/New Mexico All-Star, a JC national batting champion with a.487 batting average and a two-time conference champion. After his own playing days were over Terry decided to put his efforts into teaching kids to love the game as much as he does. He has spent the last 15 years coaching travel ball teams in the West Texas area. He has worked with numerous children of which 30-plus of them that have gone on to play at a collegiate level. Mizuno Impulse '06 assistant coach Billy Newton. As with any sport, there is more to it than just catching, throwing, and running. Coach Terry not only coaches our girls in softball, but in life. He takes his volunteer role very seriously. Our current team will attest to that seriousness with their command of seven-hour practices and their two-hour replay talks after a game. Coach Terry always holds his softball team to the highest standard. Whether it is in a game, practice, or school each girl is encouraged to give 110 percent every second and this includes off the field where they arexpected to do well in school. He will check their grades to make sure they are on track! The assistant coach is Billy Newton. He is the silent type who is invaluable as our pitch caller/pitching coach and helps us decide which tournaments to enter. Just like most any other team, each of our players has a nickname, they are good friends even though they only see each other on weekends, and they can all hang with the boys better than anyone. 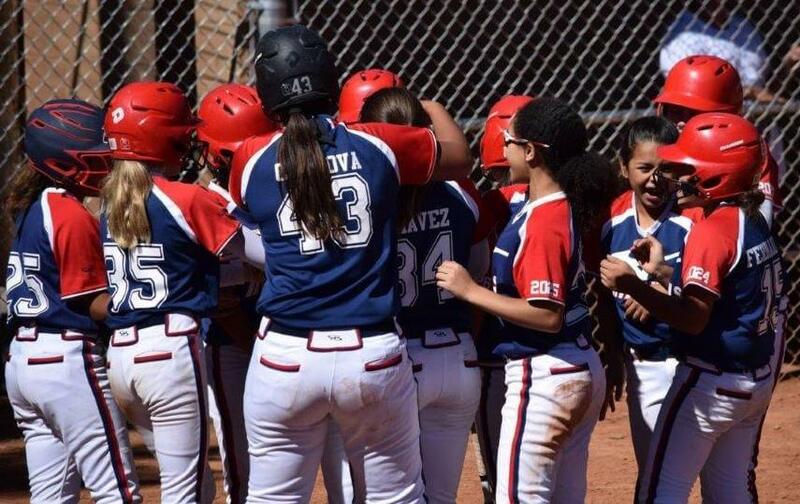 Rylee Obrien of Mizuno Impulse '06 is congratulated after her first home run. What these girls have more than anything though is chemistry; all the way up to the parents and grandparent, this group is a FAMILY. All of the girls have the desire to play at a college level, some being the first in their family to even dream of a higher education.